Cromarty Rising wishes to say a BIG thank you to all who gave their support, attended public meetings, stood side-by-side, held banners, shared knowledge and correspondence, all of which contributed to the success of the recent campaign to prevent ship to ship oil transfers in the Moray Firth. Supporters grew to include master mariners, an under-water acoustics specialist and an astonishing number of PhDs, Professors of Law and academics. Thank you to everyone who gave donations and thanks to Cromarty & District Community Council for holding those funds and providing fund management. We must also record our thanks to major financial backers, their presence in the background brought confidence and strength (and still does). We cannot emphasise enough the importance of the Freedom of Information (Scotland) Act 2002 as a significant factor in the success of the campaign. The knowledge gained provided invaluable insight, allowed analysis and went on to shape both legal and campaign strategies. Thank you to Bindmans LLP, our London based solicitors renowned for being at the cutting edge of legal developments and challenges. With Bindmans expertise Cromarty Rising was able to mount a serious challenge in opposing the award of an STS licence inside the Moray Firth Special Area of Conservation. We owe an enormous debt to Mr Ian Cowan of Highland Environmental Law. His contribution in our challenges to the Scottish Government, the Public Petitions Committee and our formal complaint to the EU Commission has been invaluable. His personal commitment and generosity to community representation has been exemplary in protecting our natural environment. 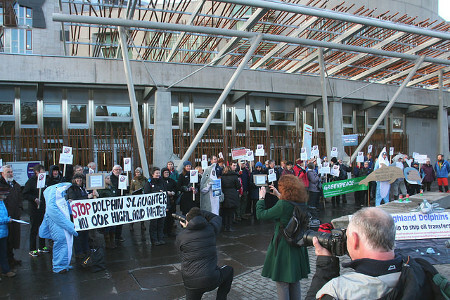 Thanks also to Scotland’s major wildlife protectors RSPB, WDC, Scottish Wildlife Trust, National Trust for Scotland etc. and a special mention for Marine Connection in Moray. A big thank you too for the support of 38 Degrees Scotland which has become such an important part of expressing the democratic voice of communities in today’s vast political landscape. We must thank members of the press from many different newspapers, who stuck with us and followed developments with genuine interest. The Wrong Plan, In The Wrong Place. Beagan Gàidhlig an-diugh - a bit of Gaelic today. 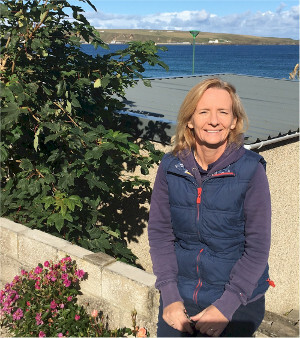 “Brògan-fiodha dealanach”, fiolm mu dheidhinn an “ Ginealachd Diwan” le Soazig Daniellou, ag innse sgeulachd de bhuidheann òigridh o Phenn-ar-Bed a tuath sa Bhreatainn Bhig. Nuair a bha roc agus pop a' spaghadh air feadh an t-saoghal, le Beurla na chois, aig deireadh na seasgadan agus toisich na seachdadan chuir iad romhpa sùil a thoirt air a' chultair aca-fhein. Chuir iad buidheann thèatair radaigeachd air dòigh, agus thug sinn cothrom dhaibh a bith beò ann an àrainneachd Bhreatnais. Ma tha beagan Frangais no Breatnais agad saoilidh mi gum bi am fiolm seo uabhasach fhèin inntinneachd. Faodaidh tu a' coimhead air an seo. 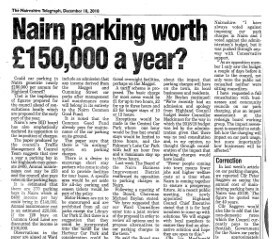 Small towns and parking charges don't work - images of Kirriemuir's first Christmas with parking charges - don't let Highland Council do the same to Nairn! Individual images here. The firefighters have raised an amazing £11,668.98 - more details here. This morning a number of children's coats have appeared tied to lampposts in the High Street. They were placed there by someone who wishes to see them go to children who need them this Christmas. The notes on each of them are self-explanatory and one is pictured below. The reaction on Nairn's social media has been instant and extremely supportive of this initiative. There has been some suggestions that, if you badly need clothing for your family, then going to charity shops can be as expensive as going to a shop such as Primark. This observer is glad to see charity shops filling spaces in the High Street, they provide employment and training but they have become more and more expensive as the years have gone by. And if you have little or no money to feed or clothe your bairns then there is no point in going into any sort of shop is there? As a community can we find new or resurrect old ways of getting clothes and other items to people that need them? Nollaig chridheil agus bliadhna mhath ùr (gun cìs-parcaidh) nuair a thig i! Merry Christmas and a parking charges free New Year when it comes! Have a good one Gurnshire! A few more pictures here. "Nairn yellow jackets unravel" There's Nairn News and then there's "The Spin"
Developers being allowed to build too many larger size up-market homes in Nairn? Young, single folk being ignored? Readers may be interested in a couple of slides show at a presentation in the Community Centre last Friday by the Community Councils and other groups to the new Highland Council Chief Executive Donna Manson. Readers can view the complete presentation here. 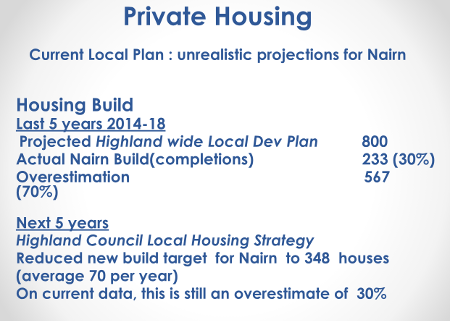 So there is the assertion that the Highland Council Development plan housing projections are heavily overestimated. However, let us concern ourselves here with the figures on the Housing waiting list. A remarkable 64% of the folk on that list want one-bedroom accommodation. We would suspect that the majority of them are young people wanting to get their first home perhaps? It shows that we are not catering adequately for a large section of the population. Just look at the homes being built up at Lochloy - it doesn't look like there's 64% of single accommodation being built up there does it? Nairn obviously needs more of this type of housing. Should planners be doing more to ensure private developers reflect this or does it have to be left almost entirely to the public sector and if so how can we get going on that quickly in Nairn? Recently the Highland Housing Alliance showed an interest in Sandown. The problem here is that, although part of the Sandown field is zoned for housing as a result of a charrette plan gathering dust on a shelf in the Courthouse somewhere (a quicker start to housing on Sandown had been envisaged back in 2012), the Highland Council has a toxic history with the community over its administration of the Common Good Land that is Sandown. The Council also has an interest in the HHA and is also the planning authority - the overlapping interests there have the potential once again to raise public concern. Another argument for putting the Common Good Fund back where it belongs under the control of the people of Nairn, rather than Highland Council? Anyway, Drew Hendry praised the HHA the other day, here's a short video he put on twitter. More about the Highland Housing Alliance here. 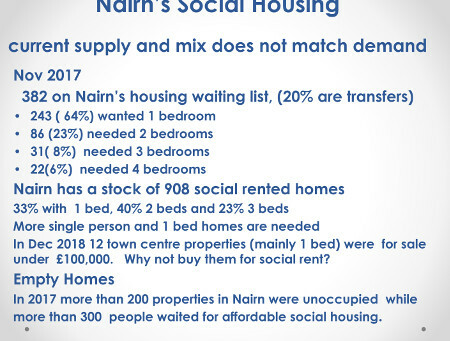 Looking towards 2019 however, would the most effective answer be for Nairn to have its own Housing Association and get building on Sandown for those in our community most in need of housing, 64% of whom need single-person's accommodation? We wouldn't be at the mercy of what Highland Council and developers want that way - the community could decide what is best. An impossible dream or something that should be possible in this new era of community empowerment and localism (let's hope too that 2019 is the year that these concepts finally hit town)? We would urge our readers to get hold of this week's copy of the Leopold Street Thunderer which has obtained the nitty gritty of what Highland Council think they can make out of Nairn's car parks. Some interesting figures there about what they want to charge. “ I understand you are saying very specifically Nairn and the thirty thousand pounds was bandied about. That's gone into the ether now, there will be a full consultation question and answer session with the actual officers who hopefully will clarify some of the questions were a wee bit difficult, went through all kinds of things.” Further details of what Tom had to say here. Well it looks like that figure has landed back down out of the ether having been multiplied by five. Here at the Gurn we would once again suggest that readers look through the looking glass to the parallel universe of the Angus Towns where local folk have voted with their accelerators, avoiding the parking charges and heading elsewhere, changing their shopping habits overnight. In these exponentially changing times for retail businesses, Angus provides real time evidence of how local authority money-making projections from parking charges turn to mush as local people decide en masse to stop using car parks. "...not providing councillors with the full range of budget detail seen by council managers means a true financial picture is not available to elected members in time for any issues to be properly addressed." But back to the topic in hand - don't let it happen here folks, get organised and resist, the Nairn BID have taken a lead in this, please support them in their efforts. So we conclude again tonight with more news from the Angus parallel universe and a letter that a woman feels compelled to write to her local Conservative Councillor after 6 weeks of parking charges in Kirriemuir. “I just sent this email to Mr Ronnie Proctor, i felt the need to do something. Peter and I have just come back from town. We saw not many people in the streets, but the cars were going round and round looking for a 30 minutes slot. The shops were empty. Several owners told us that their business is suffering badly as regular clients are staying away. We had a coffee in Annie Mays just after 2.30, the place was empty. It is so sad to see that the bustling town is devoid of people since the parking meters came in use. She decided to close at 3 o'clock. Most coffee places in Kirrie are second homes for the elderly folk. People used to come out, in the knowledge their friends would be there to meet them for a coffee and a chat. For many the only human contact of the day. I also noticed that people who would love to come to a funeral to say goodbye to a friend or acquaintance, reluctantly stay at home as the parking is too troublesome. I don't know about you, but walking through our lovely little town, I feel the heart has been taken out. I do urge you, as our senior councilor, to discuss this with the other democratically elected members of the council. I don't think it is too late to save the special character of Kirrie but urgent action is required. It is not my place nor my intention to tell you how to do your important job. Also, in this case, I don't presume to tell you what has to be done. I do know however that a compromise must be possible. 2019 will be a tough year anyway folks, don't let Highland Council make it even worse by playing Russian Roulette with the town centre economy. Readers may wish to read about the remarkable meeting that took place in the Community Centre in Friday. There's hope that the poisoned relationship between Nairn and Highland Council can be repaired and given a new start. Obviously the situation with parking charges features hugely as an obstacle to any new path that can be forged. But, anyway, another chink of light perhaps? CCs, they didn't shy away from outlining some of the problems that have poisoned the relationship between Nairn and Highland Council in recent years though. There were numerous speakers that briefly expanded on a number of topics. NICE, the BID, Team Hamish, Nairn Health Care, the Harbour Working Group and others gave a detailed explanation of their worries and their hopes for a positive future for Nairn. 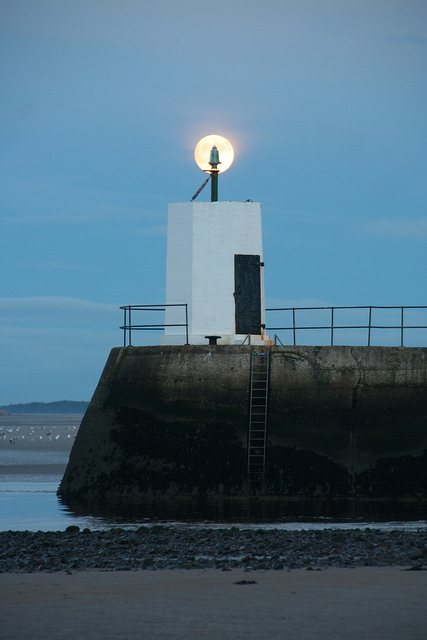 A feeling that Nairn is ready to go and get working on so many projects was pervasive and a culture change towards the Council being more inclined to listen to Nairn and to offer more help was needed. There was a wish expressed for the many consultations to have meaningful outcomes with contributions genuinely taken into account. Readers can view a copy of the slideshow here - a remarkable account of how so many volunteers in the town wish to find new ways to work together productively as a local community to get things right for Nairn and Nairnshire. It was refreshing to see her recognition that there were problems and her determination to repair the badly damaged relationship, she even went so far as to say that external help may be needed to achieve change. She wants everyone to work together. She mentioned the challenging climate that her organisation faced as a background to all it tries to do but she genuinely wants things to improve and wishes to act as a catalyst for that. It was remarkably refreshing and folk went away impressed and hopeful. Donna promises to come back with responses to the questions asked at the meeting and also is going to make another visit soon to discuss things further with Team Hamish. The elephant in the room though is parking charges. And the Councillor with her, Alastair MacKinnon, the budget convener, made his apologies over the way the parking issue had been handled so far and seemed to offer the slightest glimmer of hope that an alternative way may be found (without parking charges) in budgetary terms but with something else locally having to suffer. We really are at a tipping point. 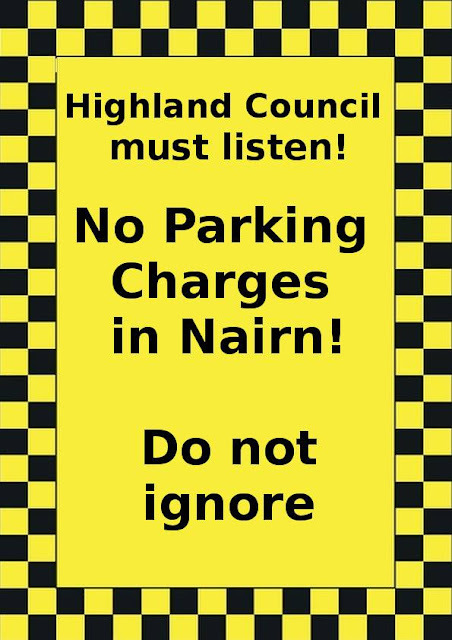 A new relationship and all the positivity that entails or a new irreparable level of toxicity injected by parking charges, souring the atmosphere in terms of Council v Nairn much more severely than anything we've seen in the past. Just look at what the immediate economic impact of charges has done to the Angus towns, with businesses being damaged and employees being paid off and all the misery that entails. Here at the Gurn we wish Donna Manson all the best and we hope that Highland Council finds a way to back off from implementing parking charges in Nairn. Fingers crossed for positive outcomes. Sheena urges anyone who receives a e-mail from her account not to respond to it as it will have a link taking you to a page where you will be at the mercy of scammers. Stay safe out there folks, some of the scamming shite looks pretty good these days. 6 Weeks into parking charges this video demonstrates how the meters are devastating the local retail economy in Montrose. It's the same in other Angus towns and it will be like this in Nairn if Highland Council go ahead with their threat of putting parking meters into our town centre next year. Don't let it happen folks, it's easier to stop it before it happens. Meanwhile in a parallel universe - a glimpse at what sort of headlines parking charges will create in Nairn next year?